Orbex’s professional team is devoted to its enthusiastic investors in a responsible way and consistent with the latest innovations in forex services, resources, and tools to aid them in performing better trades. As Orbex continues to expand on an international scale and institute themselves as a global brand, their main priority will always remain the success, happiness, and profitability of its customers. To be an industry pioneer means much more than simply leveraging the latest available technologies. The experienced staff of the company revolves around reliable, honest, and hardworking experts whose mission is providing an all-inclusive support of their traders. Orbex places an immediate response to all questions that may arise as this is one of its top priorities – which catapults the firm among the market leaders in customer support services and innovations. Fully licenced and stringently regulated by CySEC, Orbex’s trading knowledge involves currencies, Futures, CFDs, commodities, and precious metals. The centre of operations of the enterprise finds its place in Limassol, Cyprus, but it is also authorised and regulated by more than a dozen other regulatory entities in EU countries. Orbex packs a mighty trading punch for its keen investors by letting them choose between three (3) Universal accounts and two (2) ECN accounts. Not to mention the fact that all Universal accounts are Swap-free accounts that best serve Islamic traders. The Universal Mini account’s min and max deposits are $500 and $3,000, the minimum volume of trading is 0.01 lot, and the max leverage is up to 500:1. The Universal Standard account’s min and max deposits are $3,000 and $50,000, the max leverage is up to 300:1, and the minimum volume is 0.1 lot. The Universal Advanced account is characterised by a max leverage of 100:1, a minimum volume of 0.1 lot, and a min deposit of $50,000. There is no max deposit for this account. All Universal accounts are commission- and swap-free and derive benefit from a Stop Out level of 0 and a market execution. The ECN Standard account has a min and a max deposit of $500 and $25,000. It also is comprised of a minimum volume of 0.1 lot, a max leverage of 300:1, and spreads as low as 0.6 pips. The ECN Advanced’s min deposit is $25,000 and there is no max deposit. For this account, the minimum volume is 0.5 lot and the max leverage is up to 100:1. Both ECN accounts derive advantage from scalping, a 20% Stop Out level, and a market execution with no-requotes. 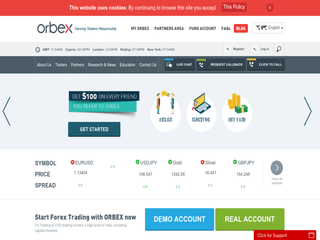 All Orbex accounts are eligible for EAs, free VPS hosting, and hedging with 0% margin. Orbex comes with six (6) trading platforms – MT4 Client Desktop, MT4 Android Trader, MT4 Multi Terminal, MT4 Mac OS Trader, MT4 iPhone & iPad Trader, and Orbex MT4 WebTrader. The MT4 Client Desktop is equipped with a host of features, involving a trailing stop, client account trading summary in real time, ECN trading, a one-hour response time for all client inquiries, the latest market research, and comprehensive indicator options and real-time charts. With the Android Trader, you obtain access to all types of orders, the chance to work from anywhere, and a complete control of your trading account. It’s accessible for a broad array of smartphones and tablets. The Multi Terminal at Orbex permits managers of assets to access, use, and monitor multiple accounts. This platform is characterised by Stop/Limit orders, multiple printing options, an internal mailing system, an internal news system, account history features, and multiple functionalities (Trading, Opening, Closing, etc.). Trading on the go is also accessible via an iPad, iPhone or iPod Touch by deriving benefit from the max power of the MT4 platform. MT4 iPhone, for instance, is similar to the MT4 for a PC in functionality since it supports most of the PC terminal’s characteristics – all execution modes, trading functions, as well as the potent technical analysis). It only lacks the algorithmic functions for trading. If you are not into the “download and install” hassle, then the WebTrader of Orbex is your desired selection. It epitomises 9 time frames, editable graphical objects properties, quick and stable performance, singe-lick trades, trade requests for Close By and Multiple Close By, and the fact that it is available in whopping 41 languages. Not only Orbex is a proud participant of the Investor Compensation Fund, which shields up to €20,000 against company insolvency or default, but it also maintains client’s money in separate segregated accounts with international, trustworthy banking entities. In addition, Orbex is a Cyprus Investment Firm, which is sternly regulated and controlled by CySEC under licence number 124/10. This certificate permits the forex firm to trade on the international arena, specialising in CFD trading of futures, currencies, indices, and commodities. The forex enterprise is also authorised by countless EU regulatory entities in the different Member States. A live help, two fixed telephone lines, and numerous e-mail addresses, as well as the “Call Back” option, are the means to access the support centre of Orbex. The team tackles every issue with the utmost attentiveness and professionalism. Limassol is the location of Orbex’s command centre and its website is available in English, Spanish, Bengali, Chinese, German, Polish, Vietnamese, Arabic, Persian, Japanese, Russian, Urdu, Indonesian, and Italian. The accessible channels for funding one of the five Orbex trading accounts are VISA and MasterCard, NETELLER, WebMoney, Wire Transfer, Skrill, FasaPay, and K-net Payment Gateway. The processing time of all options is up to two (2) hours save for Wire Transfer which necessitates from 3 to 5 working days. No deposit fees whatsoever. Withdrawing from the Universal or ECN accounts at Orbex can be executed using the same methods that you utilised for crediting the account with the exception of K-net through which withdrawals are not available. There are no extra charges except for any intermediary bank fees for Wire Transfers. 24 hours is the processing time for NETELLER, FasaPay, Skrill, and WebMoney while for debit/credit cards and Wire Transfers, this period ranges from 3 to 5 business days. At Orbex, there are multitudes of ways to obtain more money. First of all, there is a gratuitous VPS hosting. Secondly, you can refer up to 10 friends and each referral yields $100, but the referral must trade at least 10 standard lots. Thirdly, auto trading systems and a Strategizer (algorithmic system for trading forex that needs no programming nor coding to create an expert advisor) are other perks. And last but not least, the forex company also provides users with the choice to be affiliates, introducing brokers (for each traded lot – up to 2 pips commission), and institutional clients that derive benefit from a max leverage of 200:1, extremely competitive spreads, and excellent liquidity levels.